Have you ever heard of an air compressor that has a three-cylinder pump? Yes, not one, not two, but three! 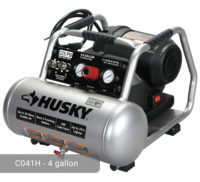 Husky 80 Gallon Air Compressor C801H Model features a cast-iron, 3-cylinder pump that is made of full cast iron for extended life and durability. There is also a 1-piece cast iron crankcase to ensure maximum protection of parts. The durable Swedish stainless steel flex-leaf valves add to the overall efficiency of this model. 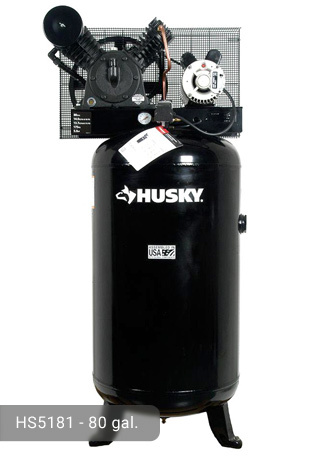 The pump of this Husky 80 gallon air compressor is oil-lubricated making it suitable for use in both domestic and commercial settings. To monitor the level of oil, there is an oil level sight glass so you can reliably see it. Additional maintenance activities are required to avoid oil residue and leaks outside the compressor. This can be conveniently done with the very accessible oil fill. The compressor uses a synthetic oil which is ideal for huge capacity models of compressor. Air delivery is very strong, 14 CFM at 90 psi and 16.1 CFM at 40 psi. With its power, the maximum pressure is at 155 psi. Multiple hand-held and pneumatic tools can be powered using this pressure level. 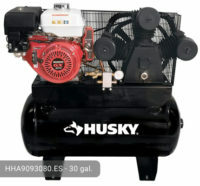 The induction motor of this Husky 80 gal air compressor can produce up to 5 HP. This is more than enough to perform heavy-duty tasks. The engine of the motor works perfectly with the support and balance given by the 12-inch cast iron balanced flywheel. The tank has a large capacity (80 gallons) so it can store a massive amount of air. More air means longer run times for multiple tools such as spray guns, grinders, sanders, and impacts. The tank is ASME approved so no need to worry about your safety. The compressor has a tank and pressure relief valve to ensure that the machine will not go overboard. The valve gives the user a bit of control over it. Because it is designed for heavy-duty tasks, a wired-formed belt guard is also installed for a more effective cooling of the pump. The single-stage compression ensures high-quality delivery of air flow. This model has a large intake filter/silence that purifies the air that will be delivered. Because of this feature, you need not worry about contaminants that can clog the other parts of your compressor. 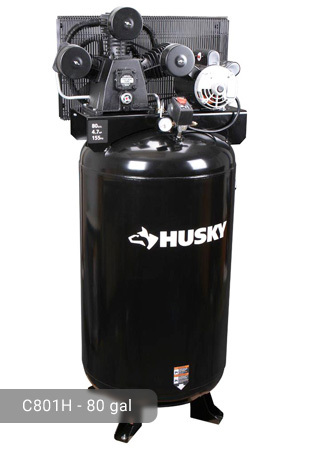 Applications such as the following, but are not limited to, can be quickly performed by this Husky 80 gal air compressor: cutting, drilling, sanding, grinding, HVLP painting, hobby nailing, etc. Both light and heavy tasks can be accommodated. The large tank which is made of steel does not allow it to be portable. It weighs 310 lbs. and has no wheels or handle so it is better left stationary. Compared to other models with the same tank capacity, this is a bit quiet (85 decibels) although you can still hear the sounds that it produces. To be safe, do not set it up in your house. It is not slim but is oriented vertically so it is still a space-saver. To operate, just plug it into a 230-volt electrical power outlet and you are good to go. You would need a 30A breaker because it takes 22 amps. 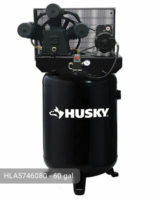 Whether you have an automotive shop or a garage for certain applications, Husky 80 Gal. 3-Cylinder Single Stage Electric Air Compressor is a good investment. From only $849.00 in your favorite Local Store, you can already purchase this very powerful machine. 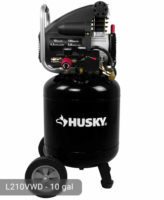 It might seem expensive for some but if you are going to use an air compressor daily, it is much better to buy this one because it will definitely last long. If you already own Husky C801H model or just want to buy it, feel free to share your review or ask a question through the form below. 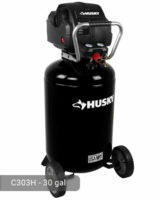 I bought the Husky C801H compressor to be able to spray autos at home. I live off grid so I needed to also purchase a generator that could run the compressors. I purchased a Champion dual fuel 7000 watt compressor with 9000 peak watts thinking it would be enough to run the compressor. I was able to start the compressor and it ran at 245 volts for the 20 minute break in time with no problem. I then closed the ball valve I installed to let the compressor fill the tank. The compressor ran fine and shut off when it reached 155psi. I Opened the ball valve and relieved the air pressure to check the pressure switch kick in. It tried to start up but struggled as the voltage meter on my generator dropped to 120 volts, then dropped even more. I shut off the pressure switch then bled out all the air from the tank and tried starting the compressor again. It once again struggled but started running at slow speed as the generator would not get above 120 volts. My question is: How many watts is the motor drawing at start up and how big of a generator am I going to need to make this run? Hello, I need a one compressor c801h 80gal. Diego, check at your local Home Depot store. It might be available there.